Neil Heseltine, left, and show judge and buyer Geoffrey Carr with the winning Lleyns. The victors were sent out by Neil Heseltine, Malham, whose grazing land rises from 1,000 ft to 1,800 ft, proving that the Lleyn - originally from the Lleyn peninsula in north Wales - has exactly what it takes to succeed against traditional upland rivals. They were bought for £108 by show judge Geoffrey Carr, Barnoldswick, who picked a pen of Cheviot ewes and lambs from Keith Robson, Flasby, as runners-up, selling for £106 to W. Oldfield. Gisburn. 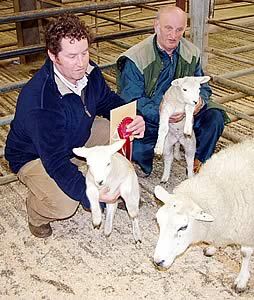 Neil Heseltine also took third place at the popular Skipton early show, which made an eagerly awaited return this year after an enforced break due to Bluetongue restrictions in previous years. Other top prices included a Suffolk-cross ewe with twin lambs, sold for £164 by Richard Umpleby, Killinghall, who also sold a pen of Texel-cross ewes with twin lambs for £152. Mule ewes with twin lambs sold to £136, while Lleyn/Swaledale ewes with twins sold to £134. Auctioneer Ted Ogden said regular weekly sales of sheep with lambs at foot at Skipton would revert to being held every Monday from April 13 to encompass the main sale season for couples.